Repeat this yoga for weight loss sequence for a more fiery practice or pair this with another video! Hi. I am a new new newbie. I have only started to watch videos, but not yet tried it! I watch you and your so awesome. Your funny and you make it look so easy. Im looking forward to trying it one day. Im just not in shape yet. But thank you for the videos and I love watching them!!!! I’m 60 lbs overweight and have recently lost about 100 lbs. I started doing Adriene’s videos about six months ago. I wasn’t and am not in the best shape. You don’t need to be in great shape. Start with the easy morning workouts or Adriene’s beginners workout. You can do this. Just starting will make you feel so much better. I just did the yoga for complete beginners video. I’ve had bad anxiety for a while so I thought id try yoga to help calm and relax me. And it did! The video was easy enough. I look forward to doing and learning more! I’m not in shape either I do my best and even though am slower than Adriene I concentrate on my breathing and execution of the moves to get them right. It has taken me 12 months to understand the breathing but I use it every day now as I suffer from panic attacks. I do it every day and I absolutely love it even though some excercises leave me knackered. I have one of those A5 spiral bound note books that have dividers in them, mine cost me £1 from the pound shop. I have divided it into 3 sections – gentle excercise, sweaty and one for exercises targeting specific muscles. I date the exercise then chose a category and write my thoughts on it and how I physically felt. It is also a good idea to have an index as once you get going and trying different exercises you look forward to what you are going to do the morrow. I wish you happy yoga just jump in with the rest of us. I really enjoy your video… I appreciate your gentle encouragement. I am working out more and find my weight is not fluctuating as much. Hi my name is Nirvaan kumar. I want to learn yoga on Tuesday to 5:30pm to 6:30pm could find me a teacher. Wow – my abs are talking, and I do core work most days. Great practice. Thank you Adriene. You’re the BEST! Hi, I just wanted to say that I really like your video. I have tried a lot of different workout DVDs but not a lot of yoga. The only yoga I have experience with is from the P90x DVDs which I find really difficult but I really like yours still a good workout but also a calming and relaxing experience. Excited to try another video. Just want to let you know that I have followed your videos every day since January this year, and had never practiced yoga before. I am 62 years old and live in The Netherlands (Europe). In summer we live in France. I feel so much better doing yoga, not only physically but mentally as well. A BIG THANK YOU ADRIENE! I wish you a Happy Christmas and a very Happy New Year. Did this video yesterday, and I am FEELING it today!! I haven’t felt tension in my inner core in a long time. Feeling the pain is great motivation that something is working, and it gets me right back on the mat! I’m thankful for these free videos and encouragement from you, Adriene! I’m looking forward to the 30 days of yoga starting in January! Loved this video. Brief but to the point. Felt like I really worked my arms and abs but at the same time felt recentered and rejuvenated. I have been watching the beginners video and i really enjoy it. Should i do a few more other excersizes of yours before jumping onto something like this? I feel like i could just pick one without rhyme or reason each day, or is there some sort of order so to speak? I can’t thank you enough for providing these wonderful videos. For people like me to stay mentally and physically fit. I don’t know if you will realize the difference you make but wanted you to know. Just wanted to say that your videos are simply amazing! I tried hot yoga and didn’t like it much but the instant I tried your 30 days of yoga I loved it! It’s so simple but pure and challenging at the same time-I can feel the differences in my body already and it’s amazing. Thanks so much for making these amazing videos, you are awesome! Keep up with the amazing work! Hi Adriene, I have been following along with the 30 days of yoga challenge and I am absolutely loving it. I just started incorporating your other videos and they are a great extension of the 30 day challenge. Thank you so much for this. Your videos are amazing. Your soft gentle voice combined with your humor is adorable and as soothing as your yoga practice. I always feel energized and worked after doing one of your videos. It is a wonderful feeling because although I love working out and challenges I do get a little stressed or annoyed when a workout is so difficult I have to pause the video, quit or just can’t keep up. Thanks again and great job! Do you have a video for postnatal yoga? Thank you Adriene, you renewed my interest in yoga and fitness! Thank you Adriene. These videos are perfect for whether I’m feeling stretchy or lazy and give me motivation to actually exercise almost daily! Love you and don’t even really know you. Thank you for your AMAZING style and approach to yoga! I enjoy it greatly. If u r looking for a great core workout I highly recommend this video! Thank you you amazing person Adriene you! I have just stared getting into Yoga and I love it!! I was a triathlete since I was a teenager, and I was an ER/ICU nurse for just about 34 yrs, until I had a patient land on me and split my knee in half. Now after multiple surgeries an two knee replacements and severe damage to my Quadricep muscle, I have been unable to exercise the way my body was used to… So over the past 5 years I’m up about 40lbs and I’m SO uncomfortable I CANNOT stand it!! My PT had suggested Yoga and I love it!! Granted it’s nothing like riding a bike 100miles a day or running 40 miles every other day, but my joints sure are MUCH happier 🙂 and I don’t think I’ve stretched like this since I was a cheerleader in High School and it’s FABULOUS!! My muscles and core have never been worked so hard in quite some time and I love it!! But do have a question or two if that’s okay … Are there some exercises that will tone and strengthen my legs and lift my tush a little more than what the Yoga for Weight Loss videos already are? and have people actually lost 40-45lbs doing Yoga as exercise and eating right? I ask because I would really like to see my scale say 130lbs again without starving or killing myself with exercises I can no longer do because of pain from an injury that was not my fault. Just wanted to drop a line and say thank you for the awesome videos! Getting back into running, and I love yoga afterwards (especially this video!) to stretch and work out those abs and arms! I also love that I can get my husband to do them with me =D Anywho hubby and I love what you’re doing and we look forward to future awesomeness! Hi Adrienne, I recently started doing yoga with your complete beginners video and I love it! Today I wanted to try something different so I tried the yoga for weight loss focus on arms and abs. I had a lot of trouble doing the floor excercises. My lower back really hurt. Do you have any suggestions? Maybe put a pillow? Thanks so much! I recently finished the 30 Days of yoga (and LOVED it) and have been doing a variety of the other videos each day since. I feel stronger both physically and mentally and it is wonderful. I just finished the Yoga for Weight Loss, Abs and Arms video and am a little worried about some pain I feel in my lower back. The 2nd to last series in this video is where I felt it the most, as I put my legs straight in the air and slowly lowered them them, I felt a strange sensation from my lower back through the back of my legs. My main question is, Am I doing something wrong? Is there a way to aboid this kind of pain? Thank you so much for doing these videos. It is a wonderful service you are providing! Hi! I’m going out of the country to a place that has no internet connection – is there anyway to download the yoga for weight loss series? Here are some downloads available for you to get by donation of your choice! 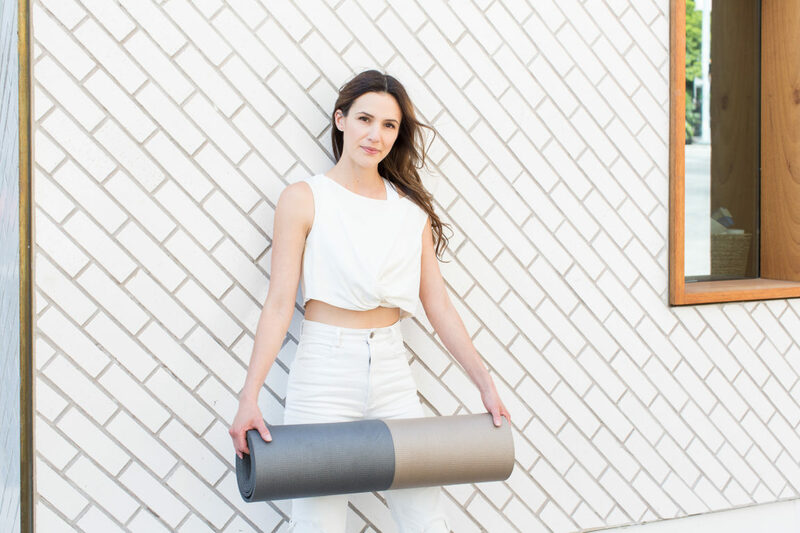 https://gumroad.com/yogawithadriene Or you can try a program at http://www.findwhatfeelsgood.com <3 Happy Travels!!! Hi there, I love you! and your videos! However, lately some of the videos freeze half way through. I’m not sure if this is a youtube issue or not. My computer is a new mac and I don’t have problems with other videos on vimeo or other news channels. Just checking if I could download and then wouldn’t have to rely on youtube streaming?? I do love you and have told soooo many people about you that now love you too! My 25 yr old daughter told me about you and said I would love you and she was right!!! Thanks! Really enjoyed the video! I don’t do much yoga, but I noticed that afterwards I felt much more…balanced, I guess? First time doing Abs & Arms and it is very challenging for me and my chicken arms! 🙂 Great work out on an area where I need more quiet strength! I’ll keep doing this one! The thing I’ve found out about this workout is: The more you do it and be mindful, the more benefit you will get! Simple, I love it! I am rajkumar from India(Tamilnadu). I am 40 lbs over weight. i want to reduce my weight especially my tummy. Which one i do to reduce my belly fat. Whether your 30 days of yoga or is there any separate video there to guide me. Any help really appreciated. Eagerly waiting for your reply. Love this workout and attention for my abs and arms. Been with you Adriene, since January. I have seen and feel the difference in my body and mind. Yoga and healthy eating is doing some amazing things to my body. I also walk 2 miles a day. Feels great to feel good!!! I see your instagram posts and you show us some things you are cooking and smoothies you are pouring. I hope you post these yummies on your vegetarian food blog. My mouth waters when I see your Instagram posts. More recipes on your yums would be fantastic. You are amazing.Thankful for you!! !